The 90th administration for the Georgia State Student Government Association has been officially finalized. And although it will be led by familiar faces, it brings change to the history of the university’s student body leadership. Jazmin Mejia, a first-generation student, will be the first Latina SGA president in university history, and the first female university-wide president since consolidation between Georgia State and Georgia Perimeter. “Being the first Latina president. That means so much,” Mejia said. As she continued, she began to cry. When asked what was making her so emotional she explained how much this meant to her and a member of the Latinx community. Mejia said this position was bigger than herself. “I’m doing this for my mom. I’m doing this for all the women out there, regardless of race. I’m doing this for every first-generation [whose] parents came here … for their kids to succeed. I’m doing this for my community – the Latinx community,” she said with tears in her eyes. Despite this election bringing the largest candidate pool in over 10 years, Mejia consistently led the race – both in the general election when she pulled 29.41% of the vote against four opponents, and again in the runoff when she dominated with a whopping 74.69% of the vote against Anthony Jones. Mejia refutes any claims that recent controversy is what won her the election, her reasoning being that she led in the general election as well. Mejia isn’t a newcomer to SGA. As a senator for the College of Arts and Sciences in this year’s administration, Mejia has been an active participant behind the scenes. She’s also worked heavily with Spotlight Programs Board as daytime chair, hosting many of the organization’s largest events, all while tripling as Phi Alpha Delta Law Fraternity alumni networking chair. Mejia’s campaign promises focused on providing more opportunity and resources for students. One goal she shared on the trail was boosting financial literacy among students by working with and holding accountable the Office of Financial Aid. She also hopes to provide more campus involvement through inter-organizational collaboration and on-campus events to bring SGA closer to the student body. Mejia’s first plan is to meet with Franklin Patterson to discuss everything she should know to be successful. Then she hopes to get straight into planning her goals by meeting with all of her executive vice presidents. 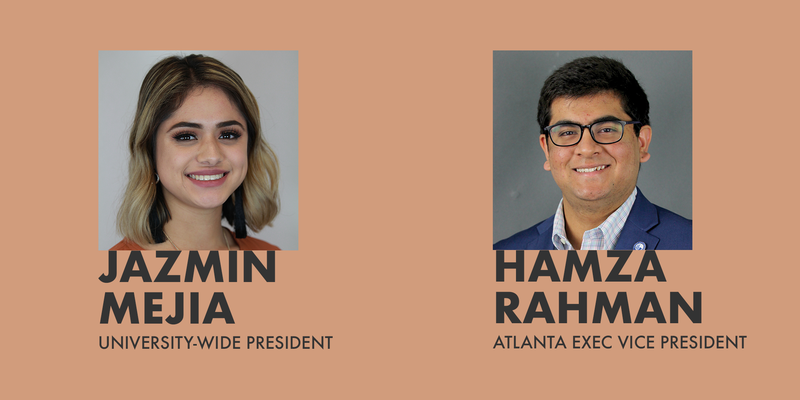 The second most powerful position in SGA, the Atlanta campus EVP, also headed to a runoff election after no candidate secured 51% or more of the vote in the general. Hamza Rahman found himself on top, though not with the same sweeping victory Mejia saw. In fact, Rahman landed in second place in the general election, with just 27.81% of the vote, behind Jesse Calixte’s 41.32%. However, when up against Calixte again, Rahman won a tight race with 53.35% of the vote. Rahman is also a political insider to SGA, having served in the 89th administration as a senator for the College of Arts and Sciences. He’s the head religious coordinator of the Muslim Students Association, volunteer coordinator for United Mission Relief and vice president of the Middle East Socio-Political Association. As a candidate for EVP, Rahman’s platform included two hot topics on campus: transportation and dining. He outlined goals for increasing the number of Blue Route buses and Blue Lot parking spaces for commuter students. Additionally, he hopes to make campus dining options more inclusive with Halal and Kosher options for Muslim and Jewish students. Rahman was surprised by his victory, but he credited his multiple endorsements, including both the College Republicans and Young Democrats. Even though Rahman said he leans left, he knew that this wasn’t about politics but rather the students and what he can do for Georgia State, which is why he thinks both organizations stood by him. Mejia and Rahman are known for their history closely working together. Just recently, in late March, Rahman introduced an opinion resolution, sponsored by Mejia, in opposition to the Georgia International Law Enforcement Exchange. However, just as Mejia and Rahman have shared in their activism in the Senate, they have shared in their controversies: Both attended a controversial trip to Israel in late December. Rahman said that despite its controversy, the trip to Israel was a great point in building their relationship. Mejia and Rahman have plans to move forward with the teamwork they’ve built over the past year. As for their competitors, Jones and Calixte have both had to set aside all hopes of holding the presidential or EVP positions, as they will begin their senior year at the same time the 90th administration begins. Jones said he’s proud of what he’s learned and still glad he took the opportunity to run the campaign. Despite having lost the election, Calixte said this won’t stop him working for the students’ voices to be heard. “I would like to express my appreciation to all the students who made the decision to vote and let their vote be heard. I also want to congratulate Ms. Mejia and I wish [Hamza] nothing but the best,” Calixte said.